Most data centers that use high-capacity SANs for mission-critical workloads employ Fibre Channel networking technologies over Ethernet-based iSCSI options. Many of those IT organizations remain committed to FC as a proven technology they say they can rely on for their most demanding workloads. FC is a lossless fabric technology designed to ensure that information is transferred between hosts and storage without dropping any data frames. Most Fibre Channel networking connections use fiber-optic cables that can range in length from 100 meters with multimode fiber to several kilometers or miles using single-mode fiber. The industry historically referred to Fibre Channel networking speeds as 1 Gbps, 2 Gbps, 4 Gbps and 8 Gbps, but the Fibre Channel Industry Association changed the naming convention to 1GFC, 2GFC, 4GFC and 8GFC. The fifth generation, 16GFC, used a different encoding mechanism than its predecessors. The FCIA roadmap lists the 16GFC line rate at 14.025 Gbaud and the bidirectional throughput at 3,200 megabytes per second, or a single-direction throughput of 1,600 MBps. The effective bit rate of 16GFC, with overhead factored in, is 13.6 Gbps. The FCIA called the next major release Gen 6 Fibre Channel. Gen 6 supports both single-lane 32GFC and parallel four-lane 128GFC and features such as forward error correction, N_Port ID Virtualization and energy efficiency enhancements. The 32GFC technology that began shipping in 2016 has a line rate of 28.05 Gbaud and single-direction throughput of 3,200 MBps, according to the FCIA. The effective bit rate of 32GFC is 27.2 Gbps after overhead. The 128GFC technology has a line rate of 112.2 Gbaud, single-direction throughput of 12,800 MBps and an effective bit rate of 108.8 Gbps. The T11 Technical Committee expects to complete work on single-lane 64GFC and parallel four-lane 256GFC specifications in 2017 or 2018. The FCIA expects products to hit the market in 2019. Some industry analysts maintain that FC SANs will die out to competing technologies, such as Ethernet-based block, file and object storage options they say are cheaper and easier to install. 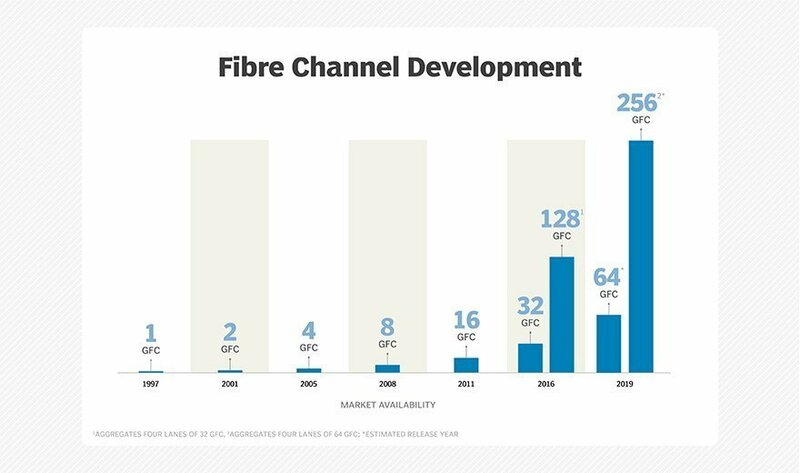 Other analysts predict a gradual decline in Fibre Channel networking product shipments, in single-digit percentages on an annual basis, from the large installed base. The growing adoption of flash storage and the accompanying need for increased bandwidth provided a boost for higher-speed Fibre Channel storage networking technologies. NVMe over Fabrics is expected to be another key technology to enable higher performance and lower latency in FC SANs equipped with NAND flash-based SSDs. The INCITS T11 Technical Committee responsible for FC standards hopes to finalize the FC-NVMe specification in 2017. What's your take on the future of Fibre Channel technology?